Magic: 2015 sees, for only the second time in the franchise's history, a graphic redesign of the cards. Wizards of the Coast has dropped the "off the shelf" Matrix Bold font and replaced it with Beleren, their own in-house font. There's also a new holofoil stamp on all rare cards, a narrower black border, designer credit given on select cards, and a redesign of the collector's info at the bottom of each card. 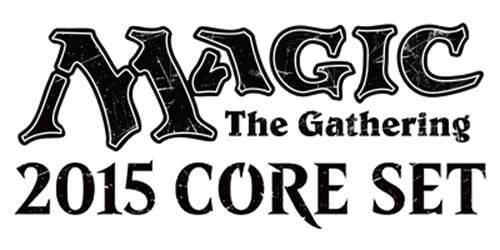 Magic: 2015 Core Set - Intro Pack - Hit the Ground Running: Push yourself to the limit with Magic: The Gathering, the world's premier trading card game. Customize your own Magic deck with potent spells and mighty creatures, then challenge your friends to see who's the fiercest predator. With the Hit the Ground Running intro pack, roll your opponents over with a host of creatures that make an impact upon entering the battlefield. Then, use spells that return your creatures to your hand to do it all again. The deck contains a ready-to-play 60-card deck featuring a foil premium Mercurial Pretender, two sealed 15-card booster packs, a strategy insert, and a rules reference card. It's another impressive and beautifully designed deck that's well worth adding to your collection. Those that are Magic fans will already have snapped this up.